But you want in the best case only installation of NWDS to support mostly the points from above. In this blog I show some tricks and hints that helps inside NWDS 7.50 (needs Java8, actually the latest available Netwever release) to generate/bugfix source code for an older NW release (e.g. for Java6) with only one installation of NWDS. Hint: The following content in only for the JEE layer/Java development. In case you need to develop stuff (like ESR content/mappings/iFlows) for the AEX layer you need a corresponding NWDS version to your runtime system. I try it with the latest version, but I have seen issues during activation/transport of AEX content like iFlows etc. Before you can develop for multiple Java versions you need some basic configurations. Inside development configuration it is necessary to check the JDK target settings for that you want to develop. This comes normally from NWDI and was configured by NWDI administrator. But in some cases for multiple tracks/existing dev. 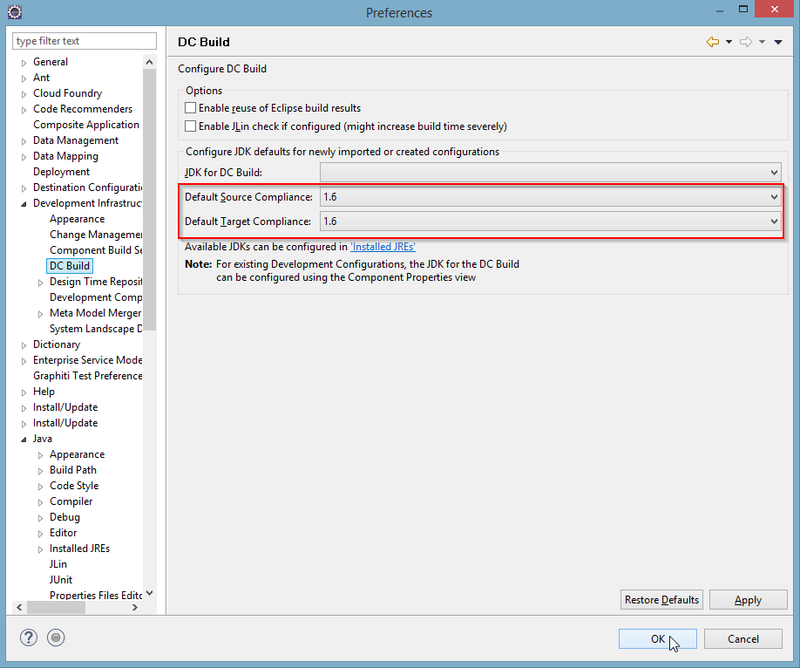 configs inside the same workspace or for you LocalDevelopment config it is better to check and switch these settings. 3. Optinally: Under the DropDown for “JDK for Local DC Build” you can specify the path to the JDK, e.g. if you have more than ones for Java6 or Java8. Normally the NWDS uses the JDK of your ant build to generate Java classes. Most of the generated classes during the aBPM framework generation are compartible to previous Java versions, but to guarantee that the generated class files are Java6 compliant an additonal tag must be insert into the Generate.xml configuration. 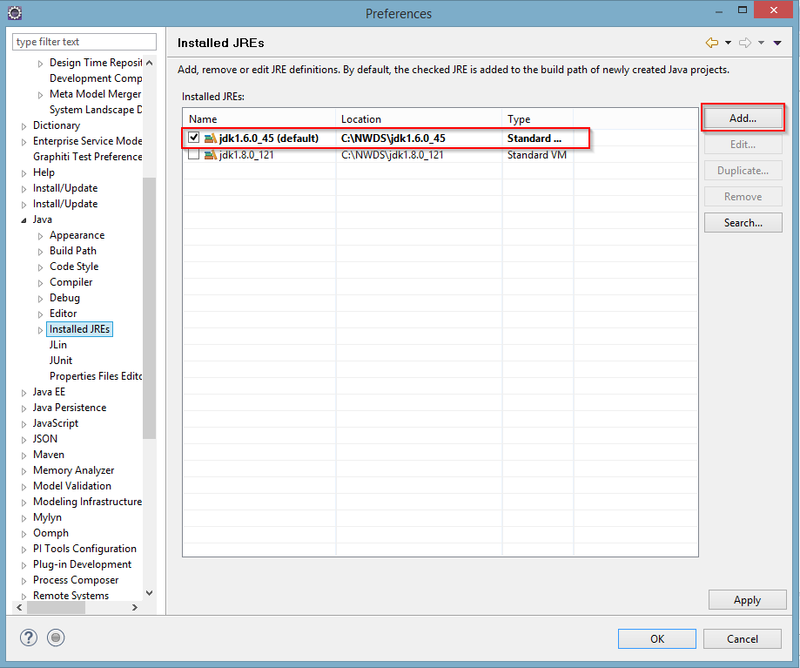 Here exists an tab JRE and this option must be reconfigured to an JRE environment that is supported by the NWDS Ant build plug in. My recommendation to set the drop down to the JDK version that is used by the NWDS itself (in my case jdk1.8.0_121). 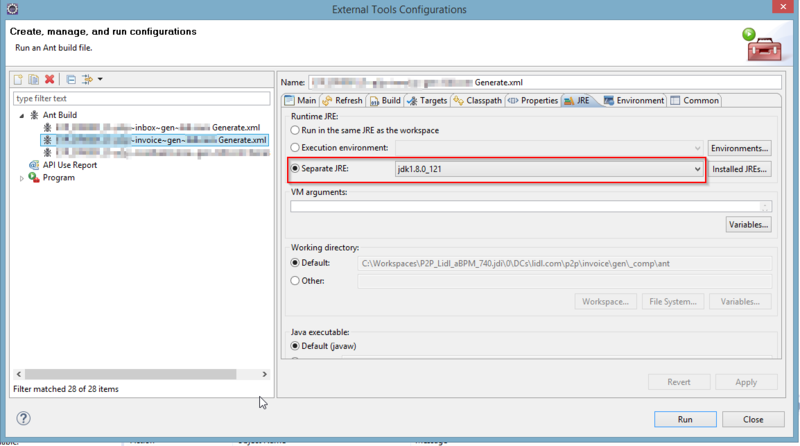 With these settings you can develop aBPM scenarios and JEE source code for multiple NW releases and different Java version in different projects with one installation of NWDS 7.50.